Which sports did I watch today? I couldn’t decide whether to go with the Rowing Women’s Pair or Men’s Cycling Individual Time Trial for my moment of the day, so I’ve gone for both! 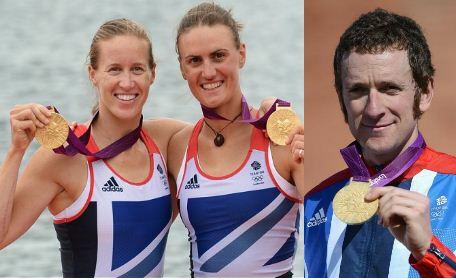 Seeing Helen Glover and Heather Stanning take the gold in the Rowing was a great way to kick off the day, especially as they dominated the race throughout. There was no doubt that they would take the medal once the race got started, much like the situation with Bradley Wiggins in the Cycling. He went in as the hot favourite and won by a margin of over 40 seconds. Seeing the host country leading the pack in events like this was brilliant and it brought up the spirits of everyone watching. The fact Wiggins became GB’s most decorated Athlete completed the day perfectly. Though he didn’t win his event, Michael Jamieson is the athlete who has impressed me the most out of anyone from the GB squad so far. Storming into the final of the 200m Breaststroke with the fastest time last night all eyes were on him in to score a medal. It took until the last 50m for him to come in contention of the gold, but those last few strokes were simply incredible. Hitting the wall just 15 hundredths of a second behind Hungary’s Daniel Gyurta he would have broken a world record with his time. He broke his personal record by a large margin, and I haven’t seen many of the GB team push themselves so hard to win. Though he didn’t get the Gold, his drive was infectious and is sure to inspire the rest of the GB Swimming team to further success this week. If today marked the start of GB’s medal chances, expect tomorrow to continue the trend. More Rowing action kicks off the day, while the start of the track cycling is sure to be just as exciting as in Beijing. The first individual final of Archery will be one of my highlights, and I think I’m going to continue my adoration for the Gymnastics with the Women’s Individual All-Around. Tags: Cycling, Rowing, Swimming. Bookmark the permalink.